6 x 12" 6 x 12" Green Top 7.5 x 17"
Buy More Cone Shaped Cellophane Bags Save More! 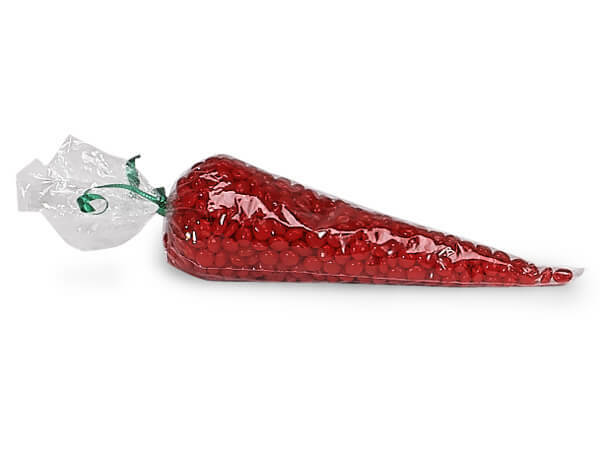 These cone shaped cellophane bags are great for candy and favors. They look great in Easter baskets, with the green top bag looking just like a carrot! You can also turn it upside down to look like a unicorn horn! Just fill, twist, and tie with our pre-tied bows or twist ties. Each bag complies with FDA regulations for food packaging, is heat sealable and offers excellent moisture & aroma barriers. These 1.2 mil "cellophane" polypropylene bags are proudly made in the USA!